In today’s business world, more and more sales professionals have to manage through multiple channels to be effective in their daily work. These professionals are the face of their products. Underneath this glamorous front, however, are many others that contribute to the overall success of the organization. The work of a sales professional in the field has evolved from expectations of independent performance to an expectation of team performance. Team performance requires cutting across multiple channels internally to provide a complete product with which to service the clients. Today’s sales people must align themselves with various departments, all of which come with their own vertical silos, reporting structures, work flows, responsibilities and geography. Not only do these folks need to manage through these complex corporate structures, they also need to present themselves as a unified front to their customers. This involves working closely with other divisions within the company. Since each department has its own, individual responsibilities and organizational structures, this can create extra work and unnecessary challenges for all involved. Without each of these moving parts working together, however, success can never be reached. The product or service your organization is trying to deliver will be doomed to fail. Don’t be doomed to fail. We live in a fast paced world and we deal with customers every day that want quick, efficient products and services. To do that we must coordinate and collaborate with the many channels required to help us put it all together each day. Think of it like a 3-legged stool. The seat represents the support of your product. That individual seat is supported by three legs that are the nuts and bolts of the people that put it all together. You take one of the legs away and the seat falls over. Without the support of all three legs pushing and working together to hold up that seat, there is no success. So, what do we do from here? How do we get everyone on the same page so that, when we face our customer, all facets of our internal teams are working together as the legs toward a common goal? This is very important. If your teams don’t trust you, they will not support you. Get to know who the movers and shakers are of each channel and educate yourself on what is important to them and the challenges they face every day. Be a resource, support their goals and objectives, shine light on their achievements and help them when the pressure is on. Be willing to understand their frustrations and consent to elevate them as best you can. Talk is cheap. Acts of being genuinely interested in someone else’s success will speak louder than words. Do your internal partners have a customer-facing role? If they do not have a customer-facing role, are you including them in your activity to maintain customer-facing value? Ask them how they might handle a situation, a problem, or a task that is customer-facing. Gather ideas from those that may be hiding in the wings. Having structural mechanisms in place that allow your internal partners to improve on the customer’s experience will greatly improve customer service. You do this by keeping an open line of communication with all involved. Start with sharing your calendar and communicating through weekly collaboration meetings to share ideas on improving the quality of your service. Remember, these meetings are not top down meetings, they are growth meetings and a place where your team can contribute. Remember, teams that collaborate with one another will always be more productive than teams that do not. Don’t break the stool. During my service in the military, I developed a passion for hand-to-hand combat. I immersed myself in Brazilian Jiu Jitsu and Krav Maga; so much so, that I was training about four to five days a week. Ritually saying Bruce Lee quotes to myself and watching Jason Statham movies over-and-over again; I dreamed of becoming a “Human Weapon.” Ya, I know. I think all the subliminal messaging from the martial arts movies and protein I was drinking was getting to my head a bit. Nevertheless, I was confident that I could handle myself if I was put in the position where I needed to. That was, until, we ran a close-quarters-combat (CQC) drill with my platoon. 1-on-1 starting on your feet. No strikes unless combat went to the ground. No strikes to the back of the head. Combat ended only if someone quits, taps out, or can physically no longer fight. “Who wants to go first?” The CQC instructor asked the class. Being in a platoon of Airborne Infantry (“Death from Above”), many of the guys jumped at the opportunity to kick the crap out of each other. Two of equal size were quickly selected and they squared off. It started off fast with both guys getting great submission attempts in while also landing some heavy strikes. Then, at about two minutes into the bout things took an interesting turn. While dropping a taser onto the mat, the instructor yelled, “use your surroundings!” The bout suddenly turned into an all-out scramble for the taser. As they struggled to keep one another from reaching the taser, the instructor announced that it was a low grade taser used for training… but, that didn’t mean it didn’t hurt. Finally, one of them grabbed the taser and hit the guy in his rib cage. Watching him cease all motion as the voltage ran through him made my confidence take an immediate nose dive. “If you find yourself in a fair fight, you didn’t plan accordingly,” the CQC instructor stated. “Now, who’s next?” The ever-rampant number of volunteers reduced to zero while everyone in the class was still trying to process what they had just witnessed. What the CQC instructor said rang through me deeply, but not only in the literal sense he was intending it to. What others may have just taken as preparation for the battlefield or your typical bar fight, I took this very differently. I wanted to start applying this philosophy to every aspect of my life. Whether I was studying for my next exam or interviewing for a job, I wanted to start overcoming my challenges with the result of landslide victories. That meant I needed to know anything and everything that was going to be on a test. I needed to know every probable question the interviewer was going to ask me. I needed to overcome all of my challenges and obstacles like I planned on fighting dirty. “Out-Thinking and Over-Preparing” became my mantra and is still a common practice of mine till this day. So, the next time you find yourself giving a presentation to a group of people that could very well decide where your career will take you, be sure to ask yourself, “Did I find myself in a fair fight?” Because, if you did… you didn’t plan accordingly. When it comes to sales leadership and the importance of a strong corporate culture Jack “JJ” Jackintelle dropped the mic at the 2017 10X Growth Conference in Hollywood, FL. Rocco, as his friends like to call him, is the president and COO of the Rick Case Auto group. At this year’s conference, he delivered a powerful message about setting the standard for corporate culture. 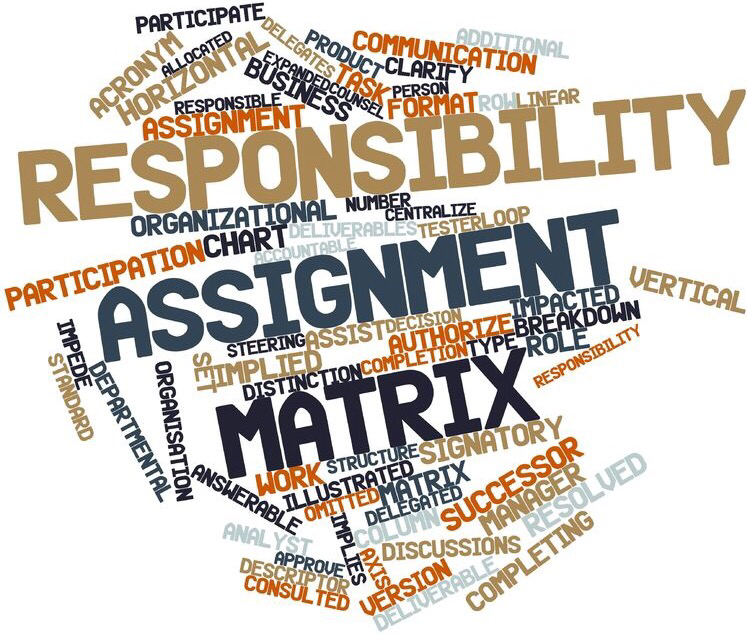 Core Values: Establishing behaviors that are deemed non-negotiable and clear is vital to achieving optimal results. Rocco referenced Chick-fil-A and their standard of saying “My pleasure” rather than “You’re welcome”. This is considered a non-negotiable that is expected from everyone on the team 100% of the time. If you do not meet those expectations, you don’t work there. Having clarity with your non-negotiable’s across the board will eliminate the bad eggs and provide the reinforcement needed to build the foundation of a results driven team and the culture to support it. Mission: Clarity was a popular theme throughout his presentation. He insisted that there needs to be a clear mission with established mile stones that everyone will believe in. The willingness of your team to take action with a clear mission moves everyone in the same direction towards success. Clear Performance Standards: Establishing minimum expectations in regards to performance is key, these expectations are “non-negotiable”. There are no short cuts. These standards are clear, established, and transparent. Having clear performance standards will reinforce the right culture for your team. Out of the five primary components this one is probably the most important. There can be no grey area. Rocco was very clear on this message of standards that are non-negotiable and apply to all. Core Competencies: Having characteristics that differentiate you from your competition can mean the difference between success and failure. Identifying these core competencies and being able to articulate them is very important. Everyone has competition and if you are not able to differentiate yourself from the other guy there is no value to your product. When there is no value, the lowest price wins. People: Are you surrounding yourself with the right people that share in your values and are they willing and able to carry the flag and believe in the mission? Are they maintaining the clear performance standards you have put in place? Putting people in place that believe in the mission will cement the foundation from which you will build. We all know there is another downturn on the horizon and it is important that we establish a strong corporate culture. There is no chance of making it through another downturn without a solid foundation. If you build on that foundation TODAY your culture will give you the strength that will carry you through any downturn the economy can dish out. Stick to these basic principles and see your business sore! In a recent Facebook video post, my Brazilian Jiu Jitsu coach, Carlos Machado, said something that can truly relate to business as well as martial arts. He said, “Nobody knows it all and nobody knows enough.” For those that know of Carlos Machado, this statement is surprising because he has spent his life training in Jiu Jitsu. He’s a World Champion, eighth degree Black Belt who has opened training academies all over the world. You might think, “if he doesn’t know it all about Jiu Jitsu, who does?” and the answer is just as he said, “nobody.” The reason is, it’s not about how long you’ve studied something, or how long you’ve been around the business because there are always, always ways to improve yourself and help those around you improve themselves as well. True leaders in business are always learning and developing their skills and adding value to the people they lead. If they do not take the time to develop and grow their own skills, then the person behind them, nipping at their heels, surely would be. Throughout my career, I have run into countless people in the business world who believe they have learned everything they need to learn or have been around the block long enough to know what they think they need to know and they are, therefore, resistant to learning anything new. What they don’t realize is, their competition, (if they are smart), has adopted Carlos Machado’s mentality and realize that standing still in the market place is dangerous. I am fortunate because I already believe what Carlos believes. I know that, it is impossible to improve at anything if you don’t take the time to work and develop your skills. I have been involved in Martial Arts in some form since I was nine years old. Now, at 43 years old, I find myself back in the Jiu Jitsu ring learning as if I had never learned anything about the art in the first place. Had I foolishly thought that I already knew it all, I would not be open to the many positive, growth-building experiences that I have had throughout my life. I have been blessed enough to train and be the corner-person for other, younger, fighters and while I know they look up to me, I hope they know that I look up to them as well because we can all learn from one another if we are open-minded enough to do so. Likewise, if you’re a leader in business, you are responsible to be a builder of legacies. You, like Carlos Machado, must help the next generation improve and learn to lead others following behind you. I feel lucky that I will never “know it all or know enough” because I can continuously strive to improve myself and those around me daily. Imagine the possibilities if everyone had this mentality. And think of all there is to live for! In today’s world of remote employees and the tsunami of tools available it is easy to get lost in the growing maze of technology and life. Field sales are an important part of any business and developing the right discipline is vital to succeed in what is in most cases a very lonely career path. Why is it lonely, well it can be very lonely because you are in fact alone to face the customer, face your boss and face the necessary decisions needed to develop and grow your business? Whether you’re selling widgets or delivering on a problem solving service there is a road map that is universal, that road map starts with you. It is a little cliché to ask that question, however I have always wondered why something so elementary gets overlooked. It doesn’t really matter whether you’re selling a 1 dollar product or a Billion dollar product it’s typically the same outcome for the majority of folks in field sales. As a leader when you are coaching about belief whether it is in person or threw a virtual mean the rolling of the eyes can really pierce the soul. If you are a leader and are reading this you know exactly what that feels like. So how do we penetrate that mindset of the excuse maker the one who doesn’t seem to have the will to do what it takes to succeed, do we show them the door or do we dig a little deeper? Attitude: Have you ever heard the term “Garbage in, garbage out!” well the reverse is also true. “Greatness in, greatness out” and without the right attitude greatness can never be achieved. A lot of things that happen in life can affect our direction and strategy. How we react to those changes can have a direct relationship with our attitudes. If we can maintain control of our perspective of life’s changes we can maintain the right attitude when executing our daily plans. In the history of selling there has never been a positive outcome of a person who went into a transaction with a bad attitude. So today would be a good day to start with a great attitude. Environment: Surround yourself with the right people, the heavy hitters, and the game changers that are never satisfied. Being around people that constantly strive to be great is contagious. Jim Rohn was right; “we are the average of the five people we spend the most of our time with“. So surround yourself with the right people because the wrong people have already given up on themselves. As well-meaning as they seem for them seeing a peer giving up on a dream only helps them validate their own bad choices, surround yourself with players and slayers and the world is yours! Execution: It’s one thing to plan it, say it and write it down for all to see it’s another to actually get out there and do it. You can have an excellent plan of attack but without the right attitude or environment to execute that plan your results will fall short, Peter Drucker famously said that “Plans are only good intentions unless they immediately degenerate into hard work”. Working to your potential will always require doing what others simply refuse to do. This is where the majority seems to fall short and seems to give up trying. Getting out there and staying on course of a well thought out plan leaving you room to learn and continue moving forward will always lead to success. All of this sounds pretty basic, however it is a stone cold fact. Your plan will only fail if your around the wrong people feeding the wrong attitude and keeping you from doing the right work necessary to achieve greatness. Start today and be GREAT! 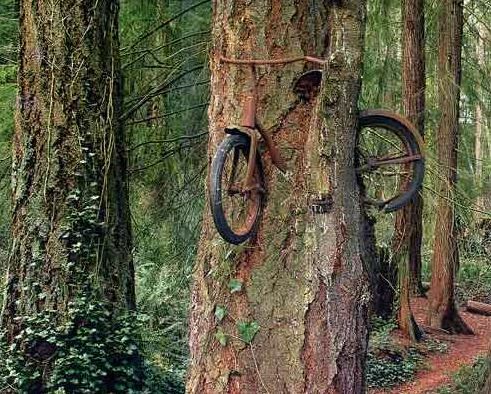 There are a lot of stories out there regarding an old bike imbedded in a tree located in the woods on Vashon Island near Seattle, Washington. The basics of the story are that a group of boys from the 1950’s biked into the woods while one of the boys left behind his bike that he had chained to a tree. Later that day he ended up walking home with his friends, never to return and retrieve the bike. As the decades passed by amazingly the tree continued to grow taking the bike with it into the air. The many stories that are out there as to how the bike really got there is irrelevant, it’s the persistence of the tree continuing to grow despite the obstacle the tree faced having that bike chained to itself.